demonstrates many of the issues and shortcomings in EOS R's user interface. Unfortunately it is greatly inferior to Canon's FF DSLRs like 5D III, 5 IV and even 6D II. Most of the points are exactly what I have been criticizing too. Incredibly stupid criticisms. Almost everything he complains about in terms of buttons is fixable by customization. He didn't read the manual, that much is clear. The drive and focus modes can be set to toggle with button presses reachable with one finger. That's how mine is set up now. EOS R manual does not replace a Mode dial which switches entire camera setup with one click, especially when using custom modes (C1-C3). EOS R manual does not replace an AF selector joystick. Especially but not only for "left dominant eye" users. EOS R manual does not make wasting precious UI real estate for a simple ON/OFF dial less stupid. EOS R manual does not make the eye detect sensor (to switch off rear display) less sensitive. And no, NONE of these things can be "customized" by user. Cool, so it's not the camera for you. A joystick would be stupid. There are too many AF points for that. Anyway, I disagree that these are big issues. You think they are. Do you own the camera? Return it if you don't like it. If you don't own it, I don't especially care either. Those are real shortcomkings and issues. Not only for me personally, but to man/most users. Even if they may buy and like the camera for its other qualities. All of them could have been easily avoided without making the camera more expensive. PS: no I don't and wont buy the EOS R. I am waiting for a smaller, less expensive FF MILC with better functionality. It's nice of you to make it easy to recognize that you have no idea what you're talking about. Until you've spent time shooting with the camera (as I have, as I own it and traveled with it to New Orleans last week) these spec-sheet criticisms of yours are meaningless. The mode dial thing you mentioned is a non-issue. It takes a fraction of a second to change the mode. Other quality cameras require a button plus a dial rotation. This is an invalid criticism. You can switch into custom modes very quickly. The touch bar works fine once you understand how to set it up and use it. I use mine to control ISO and it's a cakewalk. What the heck are you talking about with the on/off? It's a switch. It works well. There's no "precious real estate" wasted. My god what a stupid critique. I'm left-eye dominant and the touch-and-drag works great. You just don't know what you're talking about. How can you critique based on stuff you've read online? You're a joke. Unfortunately, the video mixes subjectivity (i.e. his own preferences) and objective measures of usability (i.e. time-on-task). He starts with the number of clicks to get the job done (objective) but then mixes is with his own preferences (location of buttons!). Ergonomic design is a large departmental unit in consumer electronic manufacturers and they usually look at the product from every possible perspective with verifiable data. It is rather sutpid to think that one person's perspective is superior compared to that. There is no perfect ergonomics, but I guess for "entry level" MILC, Canon considers learnability, intuitive control and user satisfaction as subjective measures and responsiveness and time-on-task as objective ones. I guess the current EOS-M camera meets those measures as its controls are intuitive and responsive enough. A novice user can grab the camera and start shooting without the need of going deep into the manual and/or set up. For "professional" MILC Canon may use other metrics and design a different UI based on that. While that may be true, IMO there’s really no substitute for a dedicated button or dial for functions like these. That allows for at least one other function to be assigned to “general-purpose” buttons like the M.fn on Canon cameras. Small things like these can make a big difference in operation between a 5D and a Rebel, or even a 6D for that matter. A second here, couple seconds there adjusting something can sometimes mean the difference between getting the shot and not. Hopefully Canon learns from this and a higher-end R camera retains (or even exceeds) the 5D-level of buttons, dials and flexibility. Most of the issues I point out here do not require owning or using the camera. A quick glance on an image of the product immediately reveals some of the issues. e.g. Putting a dial-shaped ON/OFF switch on top left shoulder of camera is a waste of precious real estate. The switch could and should have gone where it is on comparable Canon EOS bodies [5D, 6D class]. Dedicated mode dial allows faster, more direct change of modes - when needed without even taking the eye off the viewfinder. UI on EOS R also works, but it is not as good, fast and simple a solution as the one on many other Canon EOS cameras. Objectively, not subjectively. Other points are well documented in reviews, videos and postings by actual users of the camera. e.g. the poor implementation of the slider gimmick. I own the EOS R. I love the way the mode changes, I could change it without taken my eye off the viewfinder. I actually like the Fv mode which can make the need to change modes obsolete. Though I wish they had the Fv mode in the movie mode though. I could never change the modes without taking my off the viewfinder without taking my eye off the viewfinder. I don’t know why I bother to tell people how wrong they are but here I go again. Thank GOD they don’t use those stupid mode dials for the R. After using 1-series for a decade without them I don’t think I would ever stop being irritated if I actually had to use it again ... I cannot believe people claim that is better than the way a 1-series and the R works, but then I remember most people complaining have never or barley used the camera. yeah some of the choices do seem odd, but I experienced changes like it when I went from 7D to 80D. Lost joystick and a few other things, but gained so much more and there were ways to do the functions mostly the same, just different. Within a week of use I really didn't care. These changes likely wouldn't be show stoppers for me.. much of it can be overcome with customizations as indicated... to the point it becomes a matter of preference. It's almost like saying I want pink and they only offer black.. and I won't buy it because they don't come in pink! I own the 5D MK IV, and now the R. I've had it 2 weeks, and really like it for what I do. A lot of the way a person sees a camera is thru their filter for what they like to do. While the camera is smaller, and has some new features that require learning, most of the points are non issues for me. I do miss the joystick, but I have already found with my 5D MK IV that the touch screen replaces it for a lot of uses. I also keep the M-Fn slider off because my hand is large and my thumb rests on it most of the time. However, there are improvements too. All my lenses focus accurately from mfd to infinity, and focus is quick. NO MORE AFMA! I did not realize focus was quick, because I've had my old and slow to focus 50mm f/2.5 macro on the camera most of the time, it has a nice feel with that lens. This morning, the sun peeked out, so I decided to try the camera with my 100-400mm L MK II. I was shocked when it focused almost instantly. So, I tried focus from MFD to infiinity. That took less than a second, also as fast as my 5D MK IV. With TC's. I decided to really stress autofocus, so I added my Canon 2X II TC on the 100-400 and set it to 400mm. Now, focus was slower from MFD to infinity took about 2-3 seconds, but it focused and did not hunt. Then, I tried a distance of about 20 ft to infinity, it was almost instant. Since that worked great, I added my 1.4X TC MK III stacked with the 2X. Then, I focused at mfd, the lens was still at infinity and took about 5 sec to focus at mfd. Slow but it did not hesitate or hunt. Then back to infinity and focus was the same, very slow but accurate and no hunting. I tried the 20 ft to infinity speed, it took less than a second. So, I turned on the 3 meter to infinity focus limiter to check focus speed from 3m to infinity, it was again very slow, maybe 4 seconds. Finally, I just tried focusing with things that were at least 50 ft away then switching to infinity. I was back into the 1 second or less speed again, and changing focus on different objects from 200 ft or 5000 ft to infinity, was, of course, instant. So, The camera will focus reasonably well even at approximately f/16. The TC's slow down AF a lot, but thats the only case where autofocus is done with a small f-stop. To me, this means great AF at low light. Normally, even a 1.4X TC is something I avoid but its nice to see that I can use autofocus with both tc's stacked, since my eyesight is not nearly as accurate as autofocus with the R.
I have also tried AF with my 5D MK IV using similar combinations and live view. It will not autofocus with the stacked TC's unless I manually pre-focus to get it close, then it will snap into focus. I know that 1 series users do not miss the mode dial and they believe to be absolutely right, because they after all, hey, it is implemented that way on the most expensive Canon camera (same with Nikon btw.). They are wrong, nevertheless. Objective fact is - as presented in the video - dedicated mode dial works faster. It requires at least 1 user action less to switch mode (including custom modes with pre-set entire camera setups, not just Exposure/program modes). Mode dial also has a bit of a (deserved) bad rep with hi-level "pro"-body users, because of camera makers (including Canon) overloading lower level model mode dials with umpteen different "scene modes", for the (assumed) benefit of (assumed) "n00b users". But 7D/5D-class mode dials are not overloaded. Full auto, P, Av, Tv, M , B and C1-C3. Clear as daylight, intuitive and and useful. Other than maybe voice commands [ "Alexa, set baseball mode!" ] a mode dial cannot be beat in terms of operational speed, muscle memory and speed to select an entire camera setup with anything up to 50 parameters from "AF-use-case settings to flash preferences". And this is objective, not subjective. Although many folks will be willing to put up with EOS R user interface issues in exchange for other properties (eg an RF 50/1.2 which is - also objectively - clearly better than the sub-par EF version). While you turn the dial 4-5 clicks, I push and scroll in the same motion, an instant. Plus I don’t have to bother with B and Tv and the others I never use. On the fly i usually only switch from Av (80% of the time) to M (10%). 1 "blind" click of dial. Or to C3 = all the way until it hits hard stop. Would not want having to push a button and then turn a wheel or delve into some menu and tap on touch screen. Having watch the full video, the guy should have actually used the EOS R before making the video. He talked about having to do this complicated system to change exposure compensation, but in AV, and TV mode all you have to do is change the rear dial. The only time you have to do that is if you are in Manual mode and auto iso and you do not set the lens ring to exposure compensation. You can set three dials (lens, main and rear) to have control over apperture, shutter and iso as you like in manual mode so you do not need to adjust exposure compensation in that way anyway. The Nikon looks like it could be a bear to learn to use. Thanks for the nice update. I have only had my hands on one for 10 minutes but I found moving the focus points with the touch screen to be slow. What has your experience been? I tap the spot I want focused rather than trying to move the focus point with one of the controls, so for me its not a issue, but if trying to move a focus point while looking thru the viewfinder, using the tough and drag set to right and relative works best for me. The R has 18 modes - 10 for stills and 8 for video including 3 custom modes for each. So those complaining that the R should have the same mode dial as the FF DSLRs obviously haven't used the camera and have no idea what they are complaining about. If you really think an old style mode dial with 18 settings would be easier to use, please raise your hand! It doesn't take a genius to understand that for anyone used to a different button layout, the R will be different. So it takes a while to get used to what is new. That doesn't automatically mean that what is new is worse. In many cases, once you get used to it, it is better. I rented the R for 4 days. 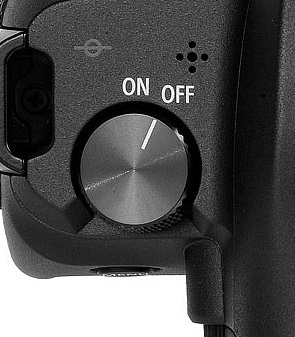 That was planty of time to reallt appreciate the ease of use of the new mode button, and as some have mentioned, the easy use of the button without taking your eye off the EVF. I customized the function bar to act as two seperate buttons - I did find the sliding aspect to not work well. But two butons (one for each end of the bar) works very well. Being used to "touch and drag" AF point selection from my M5, I now find this spec to be a must have. This camera is really easy to use. Sorry to disappoint all the Canon bashers.